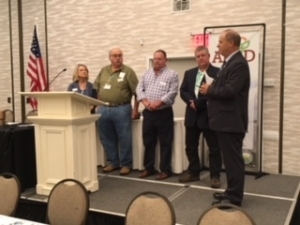 The AFCD Executive Board is elected each year at their Annual Meeting and also serve on their local Soil and Water Conservation District board. The Executive Board plays a vital role in conservation efforts by providing leadership to the 58 Soil and Water Conservation Districts of Florida. It is AFCD’s goal to bring together local Soil and Water Conservation Districts, as a single unit, through effective communication and leadership development. All this is done while helping to build the capacity and capabilities of the individual districts, expanding available resources, promoting conservation education and enhancing public awareness. The State of Florida is divided into four conservation district areas, corresponding with the Natural Resources Conservation Service Area distinctions. Each area is represented by a Vice President, Deputy Vice Presidents, and the Florida Conservation District Employees Association Representative. The Vice Presidents and Deputy Vice Presidents are members of the AFCD Board, though not Executive Members. The Vice President and Deputy Vice Presidents, with the support of the AFCD Executive Board, support and assist the efforts of the districts that fall within their jurisdiction.